It’s been a while since I’ve made a chocolate-based cookie, mainly because I’ve never been satisfied with any of them that are out there. So after a late night cookie fail, the following morning I decided to rework the recipe that Stephen and I had made and see what resulted. It turns out that I needed to adjust a few ratios and add some baking powder. These cookies are now one of our favorites! 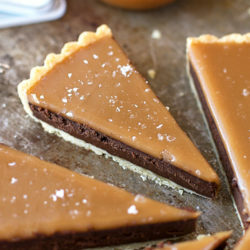 Thick, chewy, chocolately and moist- it doesn’t get much better than that! Now onto the really impressive part. 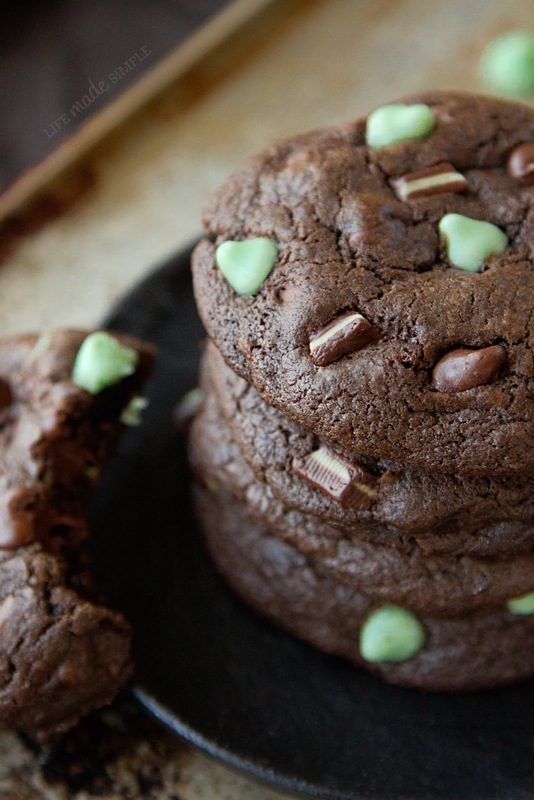 I decided that despite Stephen’s ongoing protest against mint, I would make a few “death by mint chocolate” cookies. I chopped up Andes mints, tossed in a handful of mint chips and of course added chocolate chips too. To my surprise, Stephen actually ate a few… and really liked them! Success!!! You really can’t go wrong with this dough, anything can be added to it (just sub out the peppermint extract) and it’ll be delicious! Trust me, your friends and family will be begging you to make more! 1. Preheat oven to 350 degrees. Line baking sheets with parchment paper or a Silpat mat, set aside. 2. In the bowl of a stand mixer, beat together sugars, butter, vanilla and peppermint, until light and fluffy (about 2-3 minutes). Add in “espresso” (water + espresso powder) and one egg, mix until just combined. With mixing speed on low, continue to add in egg and egg yolks until mixture is smooth. 3. 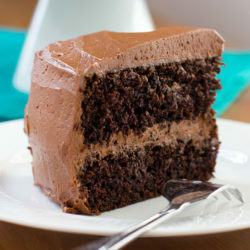 In a medium size mixing bowl, whisk together flour, cocoa powders, baking powder, baking soda and salt. With mixing speed on low, gradually add the dry ingredients, mixing until no flour pockets remain. 4. Remove bowl from stand and fold in chocolate chips, mint chips and chopped Andes bits. Cover the dough with plastic wrap and refrigerate for 30 minutes to 1 hour. 5. Remove dough from refrigerator, scoop onto prepared cookie sheets and place in oven. Bake for 10-12 minutes, being careful not to overbake! The cookies will look soft and gooey in the centers, but once they cool they will firm up (going over 13 minutes will result in hard cookies)! Remove cookies from oven, allow to cool on sheets for 2 minutes before transferring to a wire rack to cool completely. MMM… Mint and chocolate are pretty much the bomb dot com. Love these cookies!! Where did you get mint chips from? I’ve checked all the stores around me and none of them sale mint chips, do you think it would still taste good without them? I mean I still have the andes mints. Please let minty this will taste without the mint chips. 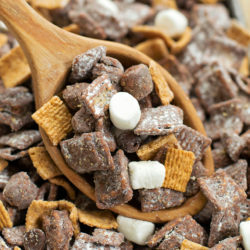 I plan on making these today. I found Andes mini candies in the baking section next to the chocolate chips, so that is what I will use in place of the chopped Andes and extra mint chips. Why just 2 eggs plus 2 yolks instead of 3 or 4 eggs? I have high cholesterol and that concerns me. Could you help me out with why you think this works better for cookies? Hi Jennifer! Good question- it’s just a matter of richness/chewiness. Perhaps you could use the base from my peppermint crunch cookies and fold in the mix-ins from this recipe 🙂 Hope that helps! « Previous PostBaby Update: We’re Almost there!